Geography atrophy (GA) is a chronic disease, which leads to visual function loss. It is defined as a round or oval area of atrophy of 175 µm or more. It is the last stage of dry age-related macular degeneration (AMD) that can result in the progressive and irreversible loss of retina. The initial symptom of GA may be found during reading, when one or several letters in a word are missing, or when looking at faces, a small part of the face cannot be seen. Some risk factors of GA are family history of AMD, smoke and increasing age. GA is classified in two types drusen-related GA and neovascularization-related GA. Drusen related GA is the hallmark of ADM: it is seen as crystalline yellow or white dots that lie between the retinal pigment epithelium and membrane whereas the neovascular process leads to a plethora of cellular stresses such as ischemia, inflammation and dramatic changes in cell environment that further taxes retinal pigment epithelium cells already dysfunctional from drusen-associated changes. According to study, “Geographic Atrophy – Pipeline Review, H2 2018” some of the major companies that are currently working in the geographic atrophy are Achillion Pharmaceuticals Inc, AcucelaInc, Alkeus Pharmaceuticals Inc, Allergan Plc, Apellis Pharmaceuticals Inc, Cell Cure Neurosciences Ltd, Colby Pharmaceutical Co, F. Hoffmann-La Roche Ltd, Foamix Pharmaceuticals Ltd, Genentech Inc, GenSight Biologics SA, Ionis Pharmaceuticals Inc, Johnson & Johnson, Novartis AG, NovelMed Therapeutics Inc, Ophthotech Corp, Ra Pharmaceuticals Inc. There are some diagnostic procedures are involved in GA, which are; autofluorescense,optical coherence tomography (OCT), multifocal electroretinography and ordinary measuring. Autofluorescense is an imaging technology to visualize the retinal pigment epithelium (RPE) in geographic atrophy: itprovides important information on expected progression rate through the amount of hyperfluorescense in the functional zone of the lesion.OCT can help early recognition of intraretinal fluid, which is important in order to start treatment and remain function. The atrophy of the retinal layers becomes very obvious by OCT technique. In multifocal electroretinography, a light stimulus is performed in patterns across the retina, and photoreceptor signaling is detected by an electrode. Ordinary measuring provides poor information on the actual function of the retina, due to foveal sparring and parafoveal scotomas, therefore microperimetry tools is used to evaluate all functions. There is currently no proven treatment for GA. Patients can benefit from increased lighting, magnification and low vision devices that help with reading. However some medication involved for GA includes nutritional supplementation formula, neuroprotection and vasodilators. Nutritional supplementation formula consist by 80 mg zinc oxide, 2 mg cupric oxide, 15 mg β-carotene, 500 mg vitamin C and 400 IU vitamin En the different stages of AMD. In neuroprotection, two main drugs are used: brimonidine and ciliaryneurotrophic factor-501.In vasodilators, alprostadil, MC-1101, moxaverine and sildenafil drugs are used for treatment of GA. Some other drugs are underway in the treatment of GA for instance emixustat and fenretinide. Additionally, cell based therapy and APL-2 injections are also used for treatment of GA. Moreover, an implantable miniature telescope is also used for treatment of GA.
Nowadays there are two strategies are being explored to prevent the GA: photoreceptor & RPE preservation and inhibition of the complement cascade. Photoreceptors and the RPE are used to devise agents that ensure adequate circulation to the choroidal vasculature, thereby preventing apoptosis secondary to ischaemia. 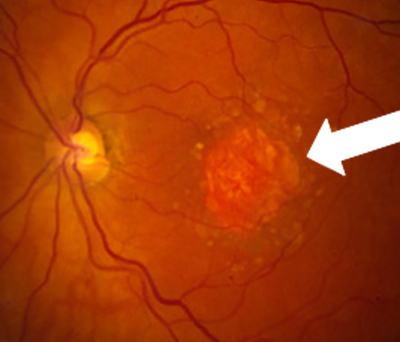 Lampalizumab is a monoclonal antibody fab fragment that inhibits complement factors and improves the efficacy of eculizumab in reducing the progression of GA AMD.